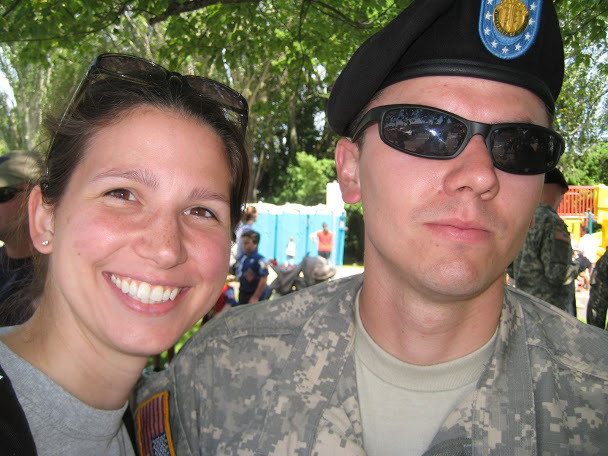 Me (Margaret Baumgartner) and one of my favorite members of our armed services. Wow. I am thrilled to be a part of this opportunity. I think all of my co-workers are also just as excited to hear about the experience, as well as read about it, on this blog. In fact, one of my Dutch co-workers happened to stop by my office and he was very interested in hearing about this project in general. A word of caution to the over-achievers (like me), the process for travel is NOT as clear-cut at it seems (is it ever?). There is a fair amount of paperwork that needs to be filled out precisely and reviewed by other parties. Luckily, Professor Edwards has a lot of patience and experience! By trade, I am a Patent Attorney with a tech company in Indianapolis. I graduated from the McKinney School of Law in 2010 and have been practicing in a corporate setting since. My family is heavily involved with the military which has affected me and my interest in the events that have shaped their lives. I also travel extensively and am incredibly fascinated with foreign policy and history. I also am fascinated with how people in other countries in the world view the U.S. This opportunity allows me to help inform people about our country, GTMO, and the ongoing proceedings (or lack thereof) of the detainees. I have previously attended the hearings for al Nashiri at Fort Meade and thus, I am prepared for the mixture of feelings this time around. I learned that it wasn’t as black and white as one would think. I again go into this with an open mind. From what I’ve read on thus far, Hadi al Iraqi was a key paramilitary commander in Afghanistan during the late 1990s, before taking charge of cross-border attacks against US and coalition troops from 2002 to 2004. I will definitely be doing more reading on this before my departure. How do I feel about Hadi al Iraqi’s connection to Afghanistan? My little brother is currently stationed with the U.S. Army in Afghanistan. This will always be at the back of mind. It is his second tour and he is not expected back until September. If this were my brother in another country, I would want a fair and speedy disposition, as well as humane treatment, for him. I was able to maintain an impartiality in my observations at the previous hearings, and expect to be able to do so again. I will also discuss my observations with my other brother who served in both Afghanistan and Iraq and even blog some of his feedback, if I can.